In Muunfel, an Angel is merely the name of a subservient psuedo-species created directly by one or more gods to act as their hand in some way. The somewhat common image of a humanoid with large feathered wings comes from the death god Cel’s usual corporeal form, and not from any particularly notable angels. His messengers do tend to take that form, as well, but there are many other kinds of angels (which, as creations of gods and not of any of the three energies, fall in the category of Mankind). For example, Cora, the goddess of water, has created angels with the form of a sea serpent. The scales on these creatures can flip, and the undersides are mirrors that sometimes show things that aren’t really there. Sil, goddess of air, has created angels that whisper in the shadows where there is no wind. Angels generally don’t have free will. They are made with a specific purpose in mind, and even if that purpose is not clear to those who meet them, they do operate on a pattern. Once they have fulfilled their purpose, they tend to develop some personality of their own, but they are still bound to the god(s) that created them. The temple to Cora, goddess of water, floats in the Tetro Ocean to the south of Genfierz’s shore. The Titan Purin makes his home in the temple. 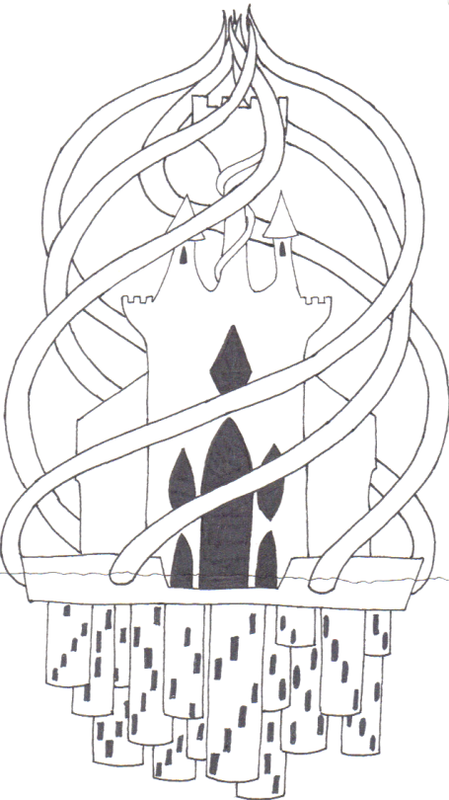 The curving structures are prehensile and will spring into motion to defend the temple if the need arises. The Four are the gods of the four elements: Water, Fire, Air, and Earth. Each of these gods has a titan of the same element, gifts from Nature itself for their stewardship. The Four and their titans have begotten several notable demigods, some of which I will list here.